We hope everyone is doing well and having a great spring. We’ve got a hand full of great guest artists coming throughout June and July and we want to encourage you to take a look in our Calendar section of our site for a full listing. If you’re interested in scheduling with any of the guest artists please contact the artist directly or reach out to us here at B13. We’re excited to announce the hiring of walk in artist Kirk George. Kirk will be helping us out with our walk in needs assisting clients without appointments on a daily basis. Check back soon so see photos of Kirk’s work and more info about his availability and start date. 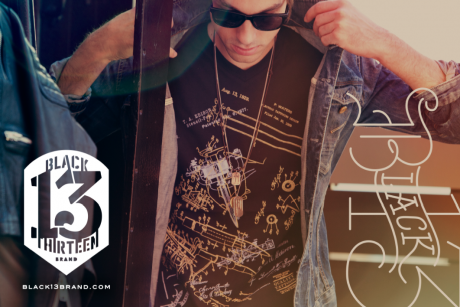 Have you checked out Black 13 Brand? We’re constantly adding new products to our online store so give it a visit to check out apparel, stickers, books, and gift cards! Instagram or Facebook user? Tag us with photos of you in B13 Brand apparel with #black13brand. Want to add us? Instagram @black13brand and Facebook by clicking here. Mark your calendars and join us August 2nd at Mercy Lounge to celebrate our 6 year anniversary! More details coming soon.